Explore delicious eats in one of Portland’s hippest neighborhoods! Known as “Alberta Arts District”, this colorful street is lined with locally owned shops, bars and restaurants. Alberta Arts District celebrates the creative individuality and vibrant diversity of Portland’s eclectic art scene. On this walking foodie tour, you’ll sample some of the best food and drink Portland has to offer, including locally inspired food fusions, artisan cocktails, hip food carts, and local bakeries, all while learning about the celebrated art, local craftsmen, and neighborhood history! The group maximum for this tour is 12. 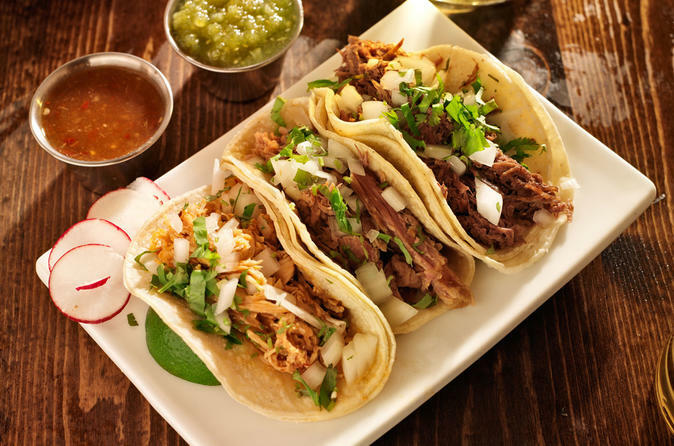 Your gastronomic journey of the area's best eateries begins by meeting your experienced foodie guide at Stella Taco located at 2940 NE Alberta St, Portland, OR 97211 at 1:30 pm. From here, you’re off to visit 6 different food and beverage stops ranging from local food favorites to ethnic specialties for which this arts district is becoming famous. Along with tasty bites from different stops, you’ll also learn about the unique street art, artists, chefs, and the local history of this prized Portland community. You’ll get your taste buds going as your guide leads you to one of Portland’s most delicious taco makers in town. Served on house made tortillas, and complimented by a local Portland craft beer, these street tacos will stand out with amazing flavor. While you’re devouring the delicious fare, learn the stories behind how our local chefs have made a name for themselves in such a foodie city, and why the local ingredients set us apart. For your next stop, you'll focus on quality of ingredients by highlighting the farms and produce from our very own Willamette Valley. Here your guide will share with you why top celebrity chefs have given a big thumbs up to this shop's delicious pork belly cubano. Paired with the asada fries you’ll also get to try a beer sample from one of Portland’s awards winning microbreweries. As you resume your food and art walk, your guide will steer you by the streets numerous murals done by internationally renowned street muralists. Listen in as your guide describes the mural subgenres, what’s bringing these muralist to Portland, and also which of these street artists have now made it into world renowned art galleries. Next, you and your guide will slip into a neighborhood bakery that mixes their own universal flour blend in house, and always prioritizes organic and sustainable grown ingredients. The menu is constantly changing to fit with our farm-to-table culture, and the bakers on hand will have a special seasonal treat ready for your enjoyment. Continuing on your art and eating adventure, your guide will take you past a few of the street’s colorful alleyways known locally as artists “free-walls”. These walls are constantly evolving and contain often-overlooked masterpieces, while showing off some of the talented, expressive minds that enrich the visual space of this community. Please note: Restaurants, wine bars, and food carts visited on this tour may vary based on day of the week and availability. Also, please bring comfortable walking shoes as you’ll be walking just over a mile during the course of this 2.5 - 3 hour tour.